For lunch and dinner, like a big one. DescriptionEnjoy meals with your toddler safely and friendly during your holidays in France. 3-point belt for maximum security. 2 seat straps adjust to fit virtually any chair. Easy to carry with its handle on the back of product. Rent a booster seat for your (grown-up) baby and have your meals with your toddler seating safely at the table high. The whole family will enjoy this time wherever you're staying (by friends, relatives or in a rented flat). The EasyDine booster seat is easy to use: easy to attach, to clean and to carry. 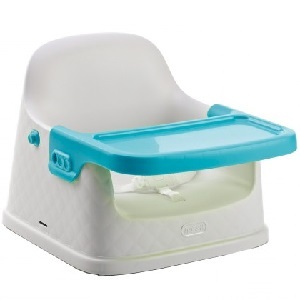 For a younger child (less than 18months old), we however recommend a high chair rental rather than this booster seat. Camille's company is responsive, reliable and efficient. The quality of Baby'tems products are excellent. I highly recommend this service.